I’m a stay-at-home, now work-at-home, mom. By the time the sun starts to reside, I am so ready for that nightly ritual called “bedtime”. Don’t get me wrong, I love my kids. I love spending time with them. But, I really look forward to a couple hours to sit down over a warm cup of my favorite tea, chit-chat with Dustin, fold laundry, read a good book, and blog. Those couple hours rejuvenate me! My children have never been the best sleepers. They have lots of energy and a zeal for life and exploring. Bedtime has not been an easy practice. We have a set bedtime schedule: bath, a little play with daddy while putting on jammies, books, and bed. It’s a beautiful routine, until we hit the last b word–bed. Every night we lay down with our children until they are asleep. I love these quiet moments laying next to them, stroking their hairs, and whispering prayers in their ear. Recently our beautiful moments of quiet bedtime have turned into an hour, two hours– oh dear, will they ever go to sleep? I start drifting in my mind to the millions of dishes downstairs, the warm tea I want to sip, the laundry I’d love to fold, and the husband I want to talk to. 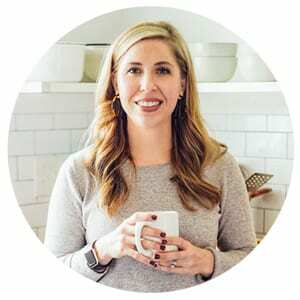 A couple months ago, I heard Katie from Wellness Mama give a presentation. Her talk was about keeping a family healthy mainly with real food, but she touched on Epsom Salt and magnesium. She discussed their importance for children and promoting sleep. I’ve used magnesium lotion for a couple years now for everything from sore muscles to headaches, but the idea of magnesium for children intrigued me. Through the stresses of life, magnesium is drained from the body. The average person is already deficient in magnesium, so this draining removes even the small amount a person has in store. Magnesium helps to produce that calming effect we get from seretonian. The result of bathing in Epsom Salt and absorbing the magnesium are: improved sleep, concentration, and relaxed muscles. A recipe for peaceful sleep! ‘Tis the season for coughs, colds, and the flu. Besides Cod Liver Oil, a healthy diet, and homemade elderberry syrup, Epsom Salt help boost the immune system. To get technical again, bathing in Epsom Salt helps to stimulate the lymph system and circulate oxygen throughout the body. The salt bath helps keep toxins at bay in the body which can naturally drain the body and decrease immunity. Of course, I immediately bought a bag of this special (inexpensive) salt. I mixed up a special, simple formula I now call the “Sleepy Time Bath Salts” and each night have been putting a 1/3 cup in the kids’ bath. I was skeptical, as I tend to be, but I have been amazed at the improvement in their sleep. Suddenly, bedtime isn’t taking hours, just a few minutes. The kids are now relaxed, peaceful, and ready to sleep. I’ve also started rubbing some of this calming homemade moisturizer on the bottom of their feet after the relaxing bath. So, here it is. The “Sleepy Time Bath Salts” formula. It’s not complicated, just simple ingredients that come together to create the ultimate calming, immune-boosting bath. I love this bath formula so much, I’ve even made a few jars to give away to family members. In a storage container (I use these), add the Epsom Salt, Real Salt, and crushed dried lavender. Mix the ingredients together. I simply shake the container once sealed. 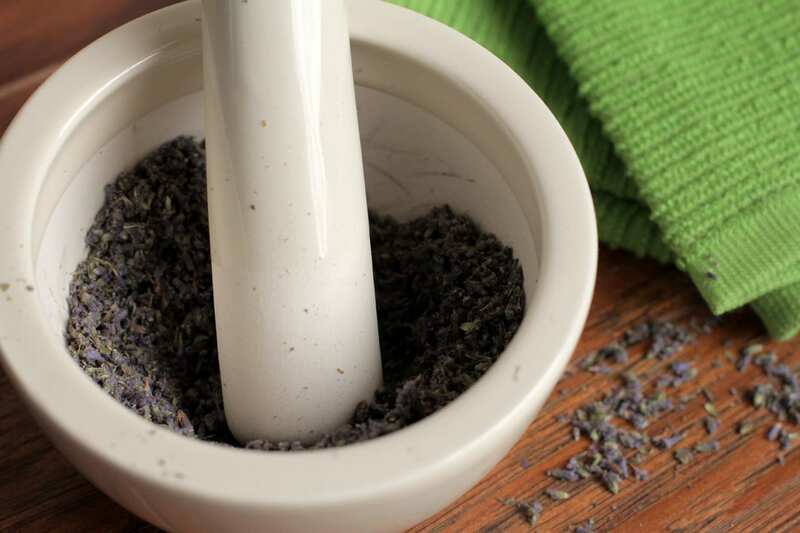 Once combined, add the lavender essential oil. Mix the oil throughout the salts. Seal the container and use 1/2 cup per bath. While the warm water is drawn, I also add 1 Tablespoon coconut oil. You can also add apple cider vinegar to help with immune-boosting, particularly while fighting a cold. How long do your boys sit in the tub? I try epsom salt baths with my boys but they don’t sit in the tub long enough. Hi LaToya, Usually around 10-15 minutes. Would this be as effective & soothing without the coconut oil? Thinking about making some for gifts & would like to just mix up the bath salts in a pretty jar without having to add a bottle of coconut oil. Let me know what you think! Thanks!! Hey Heather, I use this recipe quite a bit without the coconut oil addition. The salts are still super effective. I also give jars of bath salts away frequently and they are always a huge hit- your recipients will love them! Love your site! I use Epsom salt/lavender for my kids as well. Just wondering, why the addition of sea salt? Also, do you add the CO for any specific reason or just the moisturizing benefits or maybe as a carrier for the essential oils? Thanks! A great idea but you have to be really careful of magnesium over the long run. I’ve had a gf use it faithfully on her little guy and got into some trouble with joints, etc. Be careful with the healthiest of things…they can still backfire….do your research. Thanks for sharing your concern, Kristine. Can you provide any research about too much magnesium? I haven’t ever read any studies about too much magnesium from an epsom salt bath. You’re so sweet, Nadia :). Thank you. I hope you love the bath salts! I have a question about the salt. You use Real Salt. What is that? Can I use regular sea salt? I have that on hand. Hey Ginger, Real salt is salt that hasn’t been stripped of the minerals, so the salt adds beneficial minerals to the water. This is what I use. Oh, okay. I was wondering about the difference in minerals. That explains it. Thanks for clarifying that for me. No problem, Ginger. Yes, the minerals are the big key! The minerals in the “real” salt pack a significant “health-punch” in these salts. Regular old table salt lacks most minerals and is really more for flavoring (although I don’t recommend consuming regular table salt ;)). Enjoy!! I wanted to make a batch of these as extra little Christmas gifts for a few of my mommy friends. However, before I do, are these okay for the “free & clear only” kiddos? I know some of the kids have eczema. Hey Jamie, These are a great gift! I’m not sure how each case of eczema would react to the bath salts, but there aren’t any chemicals or questionable ingredients, so I think they would be safe. The lavender would probably help as it’s a healing oil. My boys (I have 5) all have eczema and we use Epsom salt regularly. It’s done wonders for their breakouts. But, I would caution against the essential oils at first because eczema is so touchy. We use just the plain salts or mixed with the real salt (what I cook with as well, loooooove seeing someone else using this!). And I’ve found adding a tablespoon of sesame (not roasted dark sesame) oil to the bath is even better than coconut oil, you have to clean the tub afterwards though :/ it’s kinda slippery and a little greasy but it moisturizes like no tomorrow. So really, just get them a nice big bag of Epsom salt first lol. To see if it’ll work for their child’s eczema (some don’t have as fabulous results as we’ve had sadly). Big plus, Epsom salt is safe to use on small open wounds. This happens often with eczema as kids scratch a lot. Thank you for sharing about the essential oils. I know that information will be helpful for many parents. This looks like a great recipe! I am just wondering if it would be okay for a 9 month old baby? 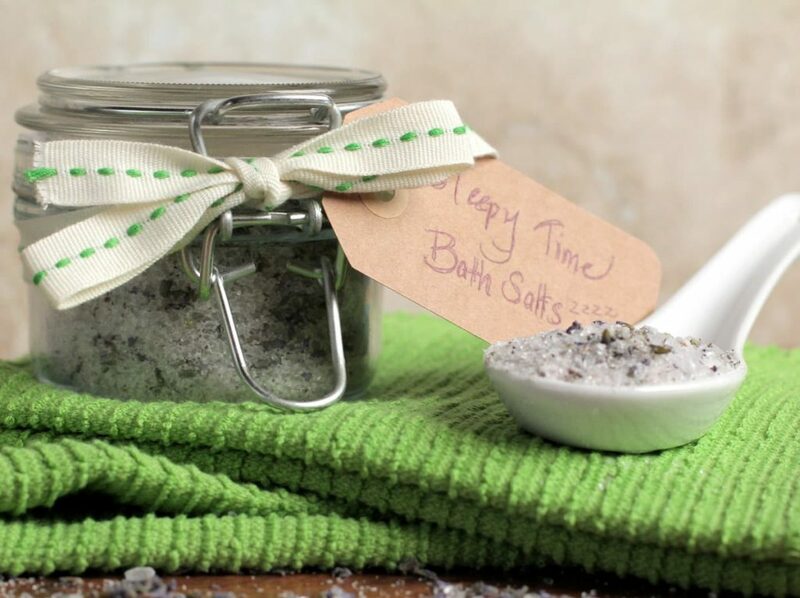 Great recipe for bath salts and not just for kids! I shared this on pinterest. I love this recipe and me and the kids definitely need it to help us sleep better! Thanks Katie! Thank you so much, Zan! I’m so glad you’re enjoying Live Simply. The bath salts are such a great way to relax at night and get ready for bed. Enjoy!! By the way, just wanted to say I subscribed to your site about a month ago. I received the welcome email but why am I not receiving any daily posts? Nothing in my spam email either. Hey Zan, I apologize that you’re not receiving the emails. Did you receive the free book email at first? I send out emails every Sunday or Monday, and many times (if you’re using a Gmail account) Google will send Live Simply’s email to the “Promotions” folder, so that’s another spot to check. I’ve sent your concern to Dustin (tech support) and he’ll email you today to help troubleshoot the issue. I thought I had signed up and I believe I got the first email. Not sure about the e-book…Well, new baby brains here so I really do not remember getting an e-boo. There is nothing in my promotions g-mail either. Maybe I will just resubscribe again. Thanks!!! Zan, No worries, I totally understand baby-brain! I sent Dustin your email so you should hear from him soon :). Try to subscribe again, too. Hey Zan, Dustin tried to contact you via the email listed here but it bounced back. It looks like you need to confirm your subscription (we use a double-confirmation newsletter system), so the best thing may be to resubscribe. Please feel free to email me: me@livesimply.me :). Hey Kim, You’re welcome :)! I’m so glad you found this recipe and it worked so well!! That’s not crazy at all. I would just be careful not to use too much lavender around boys. While there’s some small research concern about overusing lavender around/on boys (a rise in estrogen), you’d have to be using a ton of lavender essential oil (much more potent than the dried herb), which is not happening in this recipe, and it’s being diluted in the water. But it’s always good to know and keep in mind. 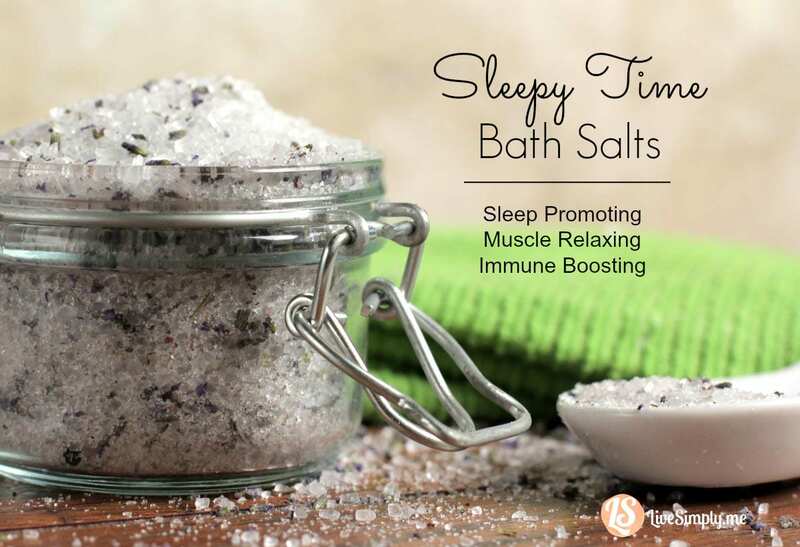 I add the Sleepy Time Bath Salts to Piper (my son) and Londyn’s bath 2 times a week. I make this recipe in large batches a couple times a year. It will last about 12 months when kept in a sealed jar (gallon-size is perfect!). Love this idea! Epsom salts baths have helped me tremendously. But… Adding the coconut oil doesn’t clog your plumbing? It does mine, and believe me, it’s so *not* pleasant having to assist the spouse with cleaning that out when the pipes get stopped up! Thank you, Homebody. We live in Florida which I suspect has been the main reason we haven’t dealt with clogged drains (it doesn’t get cold enough to chill the pipes and harden the oil). I would definitely recommend skipping the coconut oil if this is an issue :). Can you tell me why you’ve added natural salt as well as the Epsom salts? Hey Amanda, I added the salt for the minerals. You could also leave them out.